What functionality does an e-researcher need? What components need to be integrated for e-research? 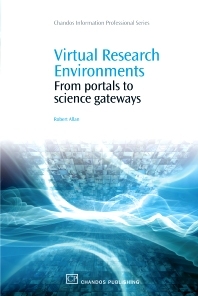 Virtual Research Environments examines making Information and Communication Technologies (ICT) usable by researchers working to solve “grand challenge” problems in many disciplines from social science to particle physics. It is driven by research the authors have carried out to evaluate researchers’ requirements in using information services via web portals and in adapting collaborative learning tools to meet their more diverse needs, particularly in a multidisciplinary study. This is the motivation for what the authors have helped develop into the UK Virtual Research Environments (VRE) programme. They illustrate generics with specific instances of studies carried out comparing portal technologies and evaluating usability. This work, and further development of collaboration and Webbased research tools has been carried out with international collaborators, in particular using the Sakai framework and other recent Java-language based portal programming frameworks and associated standards. The book is divided into a number of chapters providing motivation, illustrations, comparisons of technology and tools, practical information about deployment and use and comments on issues and difficulties in ensuring uptake of e-Science and Grid technology by already practicing researchers.